bodySCULPT® is a leading cosmetic and plastic surgery practice in Manhattan, New York City, specialized in providing minimally invasive liposuction treatments using the newest body contouring technique - BodyTite™. We are the only BodyTite Certified Center of Distinction in Manhattan, NYC. Virtually painless, FDA-approved BodyTite system uses radiofrequency-assisted liposuction (RFAL) technology for extracting fat from the face, saddle bags, chin, inner thighs, buttocks, love handles, abdomen, hips, knees, and other parts of the body while ensuring safety, comfort and superior results. Liposuction procedure with BodyTite™ is distinguished by its exceptional ability to tighten your skin up to 40% more than traditional liposuction. Along with effectively reducing fat, RFAL treatment can also simultaneously tighten the skin, providing significant body sculpting results that are long-lasting. We specialize in providing BodyTite liposuction and skin tightening procedures under local anesthesia. Our goal is a beautiful and perfectly contoured body that right for your body. Whether it is to reduce your belly fat or bring down disproportionate, oversized male breasts, the innovative BodyTite™ liposuction procedure is all that you need. Spero J Theodorou is a pioneer in the field of cosmetic surgery for his patients, focused on providing BodyTite liposuction and other innovative cosmetic procedures. Dr. Theodorou is presently a teaching faculty at MEETH and at the prestigious ASAPS. Dr. Christopher T. Chia is a board-certified plastic surgeon in New York City. As a former Program Director of the Aesthetic Plastic Surgery Fellowship at MEETH, he was involved in teaching aesthetic surgery to future leaders in plastic surgery. All procedures are performed by Dr Spero Theodorou and Dr Christopher Chia. All consultations are by Dr Theodorou or Dr Chia, and are complimentary. Why Choose bodySCULPT for BodyTite Treatment? Whether your concern is to lift the breasts, tighten the abdomen, slim the arms, or contour the thighs, BodyTite™ liposuction surgery is effective. Our plastic surgeons in NYC specialize in body contouring and have significant experience in all areas of cosmetic and aesthetic plastic surgery. Before and after photos are an excellent way to demonstrate cosmetic surgery results. Please take your time to browse through these before and after photos and understand the improvements that have been achieved by our patients. 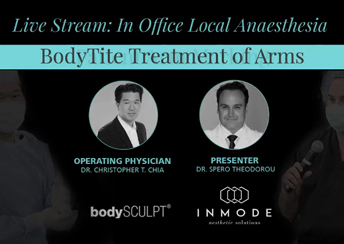 BodyTite treatment of arms performed by bodySCULPT plastic surgeons - Dr Spero Theodorou and Dr Christopher T Chia in Manhattan, NYC. The video illustrates radiofrequency assisted liposuction (RFAL) of the arms, performed under local anesthesia.